Wood decking alternatives were not readily available until the late 1990s when composite decking hit the scene. Until then, your only real decking material option was pressure treated wood. Not surprisingly, composite decking plus many other wood decking substitutes are now very popular because of the cost-savings, low maintenance requirements, durability and the fact it looks good. It’s a viable option that many homeowners opt for these days for good reason. If you’re replacing your decking or building a new deck, consider the following list of alternatives to wood decking. After our list, we set out an extensive list of example products you can check out. The most popular non-wood decking materials are composite and PVC. The rest in the list, while an option, aren’t terribly popular. There are many options other than natural wood for a deck. Composite decking has gained popularity over the last few years, due to the durability and strength. Constructed of recycled plastic and wood fibers, the resistance to slips, rot, UV rays and pests is unmatched. This virtually indestructible composite is appropriate for a wide range of decking needs. The cost of composite is relatively higher, at 2 to 5 times more than a traditional wood deck. A very popular option which is synonymous with composite decking is Trex decking. Available in a wide range of colors, offers very low maintenance, and looks good year-round. In harsh environments, composite decking material provides a long life for your deck. Other brands include NewTechWood, Fiberon, MoistureShield, TimberTech and Veranda. Paintable: Can you paint it or not. Some you can and others you can’t. Pool: Is it suitable as pool decking (if that’s your use). UV protected: Does it come UV protected? Water resistant: Is it water resistant? Slippery factor: Is it non-slip? Plastic Decking sounds a little weird, doesn’t it? However, it is in fact a thing, and many homeowners find this type of decking best suits their needs. It is strong, will not splinter, and makes little noise. It also is easy to install, which makes it a great candidate for DIY projects. Crafted from PVC, the strength of this type of decking can withstand the elements, and is free from bugs and rot. Tongue and groove installation can be applied over existing surfaces, and are constructed in ridged design to ensure hardness. Like most things plastic, the cost is a little more affordable than some other materials, at $4 per board. Just like your inexpensive kitchen vinyl tiles or planks, there are vinyl deck materials available for outdoor use. Econodek offers a membrane that can cover simple plywood decks to offer a waterproof finish, and complete DIY kit for a 12′ x 12′ deck will run you around $1500. Of course if you choose to hire a professional to install the price rises. The advantages of vinyl are similar to anything else that is made with vinyl, including resistance to wear, durability, and water resistance. Additionally, the vinyl material is resistant to UV rays and sun damage. VersaDry is an alternative brand that boasts a cooler surface in the sun, comfort coating for shock absorption, and scratch and stain resistance. Adding additional options such as no-fade colorfast from manufacturers such as EZ Deck, Kroy, and Dream Deck. Prices are between $13 and $22 per square foot, and this does not include substructure. The cost of materials for Aluminum comes in at an average of around $10 per square foot, and depending upon the results that you are looking for aluminum may be the choice. Rust and rot free, Aluminum provides a lasting deck that needs little maintenance and upkeep. While a bit more pricey than wood, the life of Aluminum pays for itself over time. Considered the most durable decking material on the market, Aluminum does not succumb to rot, mold, termites, or rust. Strength and durability are unparalleled, and the finish is equally appealing. Due to its lightweight properties, it is also easily installed. If you are starting with a concrete slab or patio, wood tiles are a viable option to update that existing pad with a new and fresh design. Available in Hardwood and basic wood styles, these tiles are specifically designed to work with an existing slab. Durable, rot and mold resistant, as well as pest-resistant wood tiles create an appealing finished design that differs from standard plank installation. Set in a contrasting pattern, this type of deck offers a unique design without a complete deck install. Available in several finishes, the tiles are strong and resilient, resistant to weather and compliments any landscape. A lot of old concrete slabs begin to chip, crack, or just look worn, sometimes having an old ugly coat of paint. Adding wood tiles gives the appearance of a brand new deck, with a much easier application process. They range in price depending upon material, and can cost upwards of $18 per square foot. Tigerwood tiles are a beautiful option and widely available. Taking the world by storm, Bamboo has been implemented in many materials, due to the strength of its fibers, the pulp inside, and ability to withstand moisture. The pulp inside the bamboo has been harvested to make even pillows and quilt batting due to the incredibly soft nature, even more so than cotton. 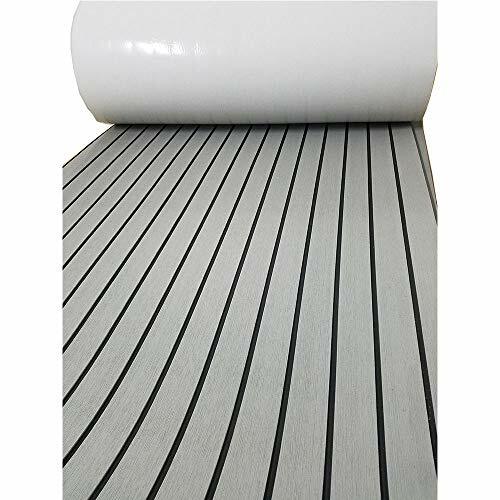 There are two distinct types of bamboo decking, woven fibers and non woven fibers. The stronger of the two is obviously the woven type. The natural beauty of bamboo is undeniable, and in many climates can provide a lasting deck if maintained properly. With any wood style deck, it is going to take work to keep it at its best. Bamboo is no exception, and will need sealed and stained or pigmented. It will fade over time, so slapping on a coat of sealant in its natural state is not recommended. Additionally, areas that see a lot of rain or flooding, puddling, or marshy lands will not benefit from bamboo. It will deteriorate and harbor mildew. Woven types of bamboo is much more resistant to this problem, but still not waterproof. In standard moist areas and hot climates bamboo will serve you well. 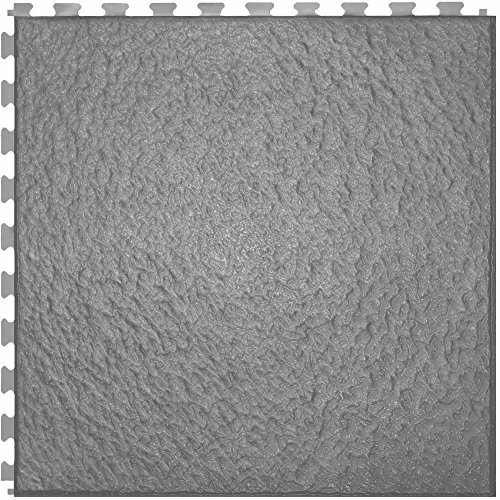 This interlocking rubber paver is made using granular material which is micro-porous. The granular material itself is made from high density rubber. It is therefore very durable, wear resistant and comes with very good elasticity which is ideal and comfortable for the feet. The paver is water permeable, non-slip even in the rain and suitable for outdoor use. It comes with an interlocking design that can be installed without adhesive. They are hence very easy to install. Example product can be viewed here. 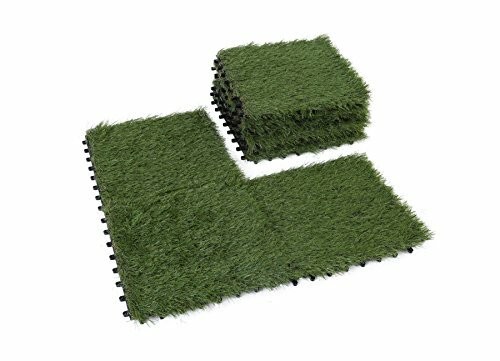 These artificial deck tiles come with 9 pieces of 1*1 inch interlocking grass deck tiles with a height of 1.5 inch pile. The grass is top quality, very durable with low maintenance. There’s no need for fertilizers, pesticides or mowing. The grass deck tiles are thus able to provide beauty to your patio, rooftop, yard or deck. It also has a great drainage system that makes it easy to clean. The materials used are environment friendly and can be recycled. The latter are also non-toxic making it safe for use by children and pets. It is suitable for outdoor activities such as camping, picnics and parties. This decking material is made out of high quality EVA(Ethylene-vinyl Acetate) materials. These materials are elastic and environment-friendly. The EVA floor has good ability of seismic resistance, buffering, chemistry resistance, moisture resistance and non-absorbent qualities. It offers a good choice for boat building. This is because they tend to provide an efficient non-slippery surface for the boat in both wet and dry conditions. 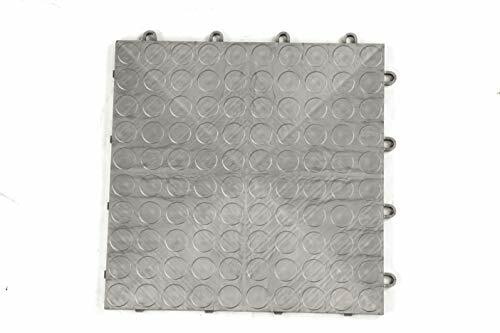 These Grid-Loc floor tiles are designed to withstand the harshest environments especially encountered in garages. They are therefore designed to handle very heavy rolling vehicle loads. They are also resistant to grease, oil, petroleum products and other chemicals that may be dangerous. Installing them is easy, as it involves snapping adjacent garage floor tiles together to form a garage floor that can last for very many years. They are UV stable, stain resistant and slip resistant. They provide high quality garage tile alternatives with a 12 year warranty. UltraShield Outdoor Composite Deck Tiles by NewTechWood are an easy and quick fix for covering up unsightly or cracked balcony or concrete patio. These deck tiles snap together and allow rain water to run through. They are a perfect solution for a deck or roof top patio since they are made from high density recycled plastic composite material. They are made from NewTechWood proven UltraShield technology that covers the core material with multi-chromatic poly shell hence protecting it. This Interlocking Deck Tile provides a modern outdoor modular flooring. It comes with a self-draining surface that is specially designed to withstand excessive use and extensive UV exposure. It works best to provide an upgrade to your outdoor space, as well as cover for unsightly cracks. 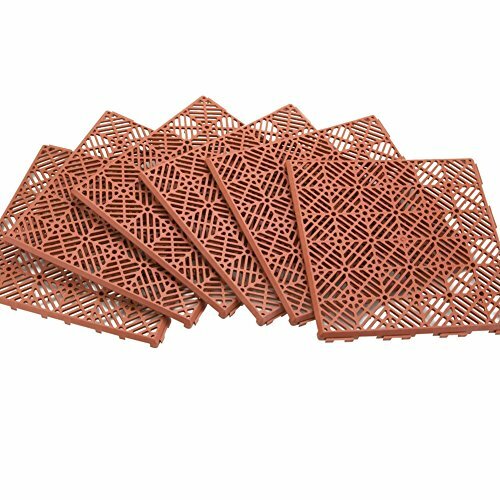 These decking tiles come with 6 interlocking tiles that are closely snapped together. They are made from durable polypropylene that comes with an openwork pattern that ensures effective water drainage. Each of the tiles measures 11 1/2 inch square and covers a paved area of 3 ft by 2 ft. 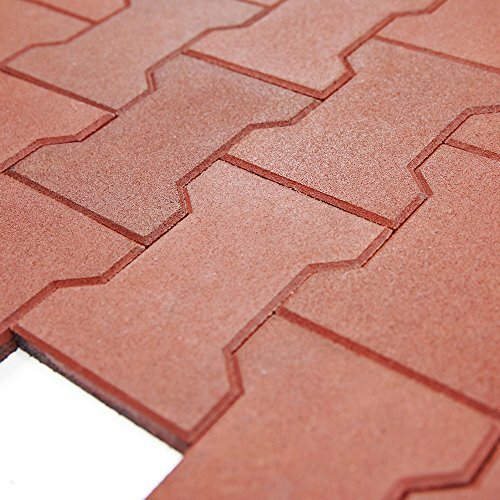 These interlocking tiles are made from flexible PVC plastic. For this reason, they produce a warmer, softer and a more comfortable option compared to the ceramic and natural stone alternatives. The material also ensures chemical resistance and long wear life associated with PVC tiles. Coming with a 25 year warranty, they not only look beautiful; but are also long lasting. The beautiful collection of tiles features different colors hence you get to pick a choice of your liking. It can be installed in garages, kitchens, playrooms, garages, basements and laundry rooms. Resistant to chemicals associated with PVC tiles. Ultrashield natural outdoor composite deck tiles are outfitted by exotic composite finish to give it a trendy look. The tiles are easy and quick to fix which enables it to be fixed without much time wastage. The tiles are made using high quality density recycled composite plastic material. They therefore offer the perfect solution for decks and roof top patios. The deck tiles can easily snap together and allows rain to easily floor through. They are manufactured using ultrashield technology which protects the core material with a multi-chromatic poly shell. 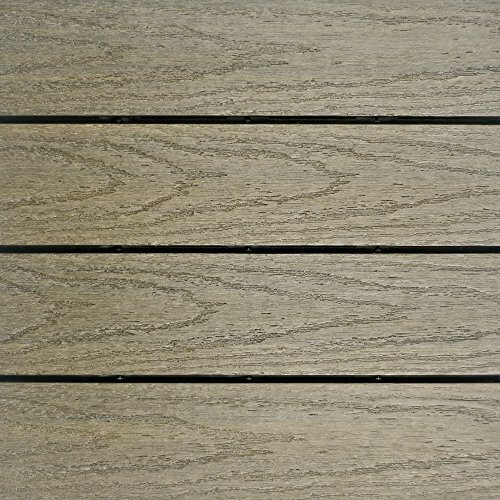 It provides one of the best wood decking material options.